Wilmington, DE -- There are many baseball movies which have earned the distinction of classic. One such film is celebrating its silver anniversary in 2018. 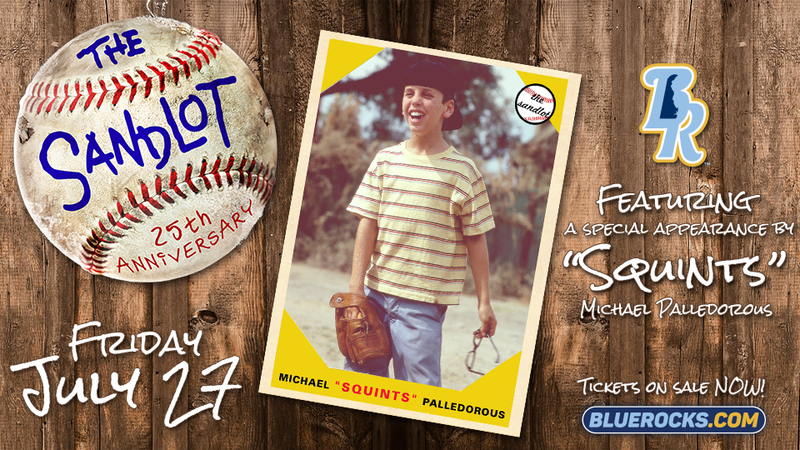 On Friday, July 27, the Wilmington Blue Rocks are honoring that movie with The Sandlot 25th Anniversary Night at Frawley Stadium. The evening will be highlighted by a special celebrity appearance from Chauncey Leopardi, better known to most fans as Michael "Squints" Palledorous. Leopardi will hold a meet-and-greet plus sign autographs prior to first pitch and during the game. There will also be The Sandlot-themed music, videos and entertainment as part of the celebration, while fans in attendance will have a chance to win copies of The Sandlot 25th Anniversary on DVD and Blue Ray. Celebrate a quarter century of laughter and friendship with The Sandlot's 25th Anniversary Collector's Edition - available now! This crowd-pleasing gift set includes a set of 10 custom Topps® baseball cards - featuring Scotty Smalls, Benny "The Jet" and the rest of the ragtag roster - created exclusively for this release! The major-league treatment continues with an all-new booklet filled with behind-the-scenes photos from the film director's personal archive and an all new, full-color team poster! So gather your best buddies together for a winning comedy-adventure and a whole lot of fun. Play ball! The Blue Rocks open their season on Thursday, April 5 at Potomac and start their home slate at Frawley Stadium on Thursday, April 12 against the Lynchburg Hillcats. Individual tickets, season seats, mini plans and group packages for the 2018 season are on sale now at BlueRocks.com.